Here is a happy news for all OnePlus phone users. 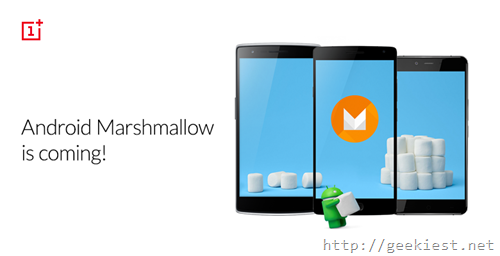 OnePlus today confirmed that all its Phones will be receiving the Marshmallow (Android Version 6.0) upgrade. The Cyanogen OS upgrade for the OnePlus One will be available in the first quarter of 2016. The Oneplus 2 upgrade also will be available in the first quarter which will include the new standard Marshmallow API for the fingerprint sensor. For the OnePlus X users, the company assures that you will be receiving the Android 6.0 upgrade, but they have not mentioned any time period. The OnePlus 2 will also be updated in Q1, and the update will include the new standard Marshmallow API for the fingerprint sensor. We’ve heard requests for us creating an API for the current fingerprint implementation in OxygenOS, but have decided against this since we’re switching over to the standard Android M implementation soon. All OnePlus phones will be recieving Android 6.0 upgrade, here is the schedule.